Through the development of new in situ chemical sensors will come a greater understand of ocean biogeochemistry. Recent advances in chemical sensors have already started to revolutionize oceanography and even expand the breadth and depth of ocean exploration. Sensors that can make measurements over broad spatial and temporal scales that are easily deployable are of critical importance in a range of locations, from the coastal environment to the open ocean. Shifting from a discrete sampling approach, which provides only a temporal snapshot of the ocean, to an in situ sensing approach will allow measurements to be made at the same time and spatial scales as biogeochemical processes. Here I will present our recent developments in oceanographic chemical sensing. These sensors utilize laser spectroscopic techniques for non-invasive measurements. Much of our efforts have focused on bringing technologies to the ocean that have previously been used solely for atmospheric sensing to help to close critical gaps for in situ sensing. By utilizing laser-based techniques coupled to gas extraction techniques, we can measure gases critical for understanding ocean biogeochemical processes such as methane and carbon dioxide. 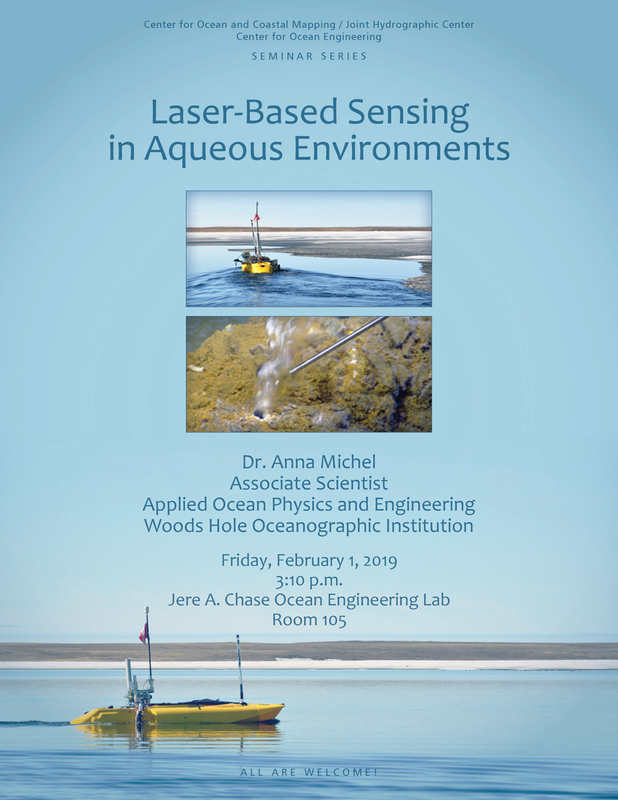 Here I will describe the laser-based sensors and sensing platforms that we have developed including the ChemYak (autonomous kayak) and deep-sea laser spectrometer and results of field deployments using these systems in environments ranging from estuaries to the deep ocean. Anna Michel received BS degrees in Chemical Engineering and Biology and a masters in Ocean Engineering from MIT. She received her PhD from the MIT – WHOI Joint Program. Michel was a postdoctoral fellow at the Center for Mid-Infrared Technologies for Health and the Environment at Princeton University. Michel returned to WHOI in 2012 where she is currently an Associate Scientist. Michel’s research focuses on the development of in situ chemical sensors and sensing platforms. Each year Michel runs a 4-day outreach program for middle school girls to teach them about the exciting field of ocean engineering.